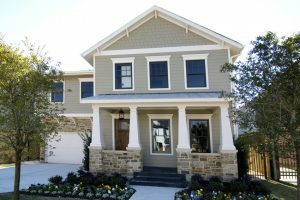 Your home’s architecture can surely standout with a splash of new color, but if you’re looking to one up yourself, try adding a few varieties of siding to your home’s exterior for a truly eye-catching abode. James Hardie® products are well known for their siding types, with HardiePlank® lap siding as its most popular choice, along with durable HardieShingle® siding as a bold accent option. The shingles come in staggered edge panel for a more rustic look, and a straight edge panel for a clean-lined look. We can’t get enough of the polished look of straight edge HardieShingle siding. Whether it’s a large front gable on your Arts and Crafts bungalow or the entire face of your refreshed farmhouse, the rows of clean-lined shingles add detail and highlight the architecture of your home. The body of this updated Craftsman is clad in ColorPlus® HardiePlank lap siding in Monterey Taupe, and the front gable of the home stands out in straight edge HardieShingle siding in matching Monterey Taupe. 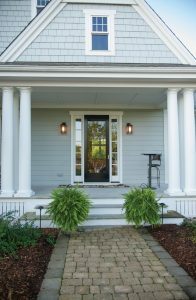 The crisp Arctic White HardieTrim® boardsand white columns make the taupe siding pop. This light blue beauty is clad in HardiePlank lap siding and straight edge HardieShingle siding in the same light blue color. The homeowners chose to clad half the home in shingles and half in lap siding for a clean look. We love this Craftsman sporting a combination of shingles and brick. The upper portion is clad in cream straight edge HardieShingle siding and the lower portion in complementary brick. The crisp white trim and columns tie the whole look together. 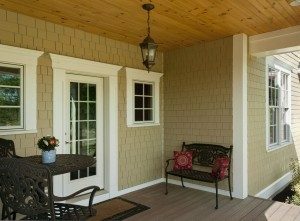 This inviting front porch offers a closer look at a home clad in straight edge HardieShingle siding in Autumn Tan. The Arctic White HardieTrim boards differentiate the architectural elements of the home in a subtle and sophisticated way. 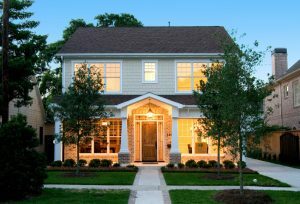 Design your home’s exterior with the main goal of highlighting its architecture. Opting for more than one siding choice is a simple way to add variation and charm to a could-be flat-looking front. You can also feel secure knowing any type of James Hardie siding variety you choose is durable. After all, every James Hardie product has been tested and engineered to help withstand and resist damage from pests, fire and Midwest weather (such as freezing temperatures, moisture, snowfall, ice, hail, wind and extreme temperature variations). You’ve got a sturdy selection of siding and shingles, in a wide range of color choices, all at your fingertips.